The workshop will take place in Nanyang Technological University (NTU) at LT3, LT4 and LT6, North Spine. Please refer to the Map of NTU Campus. NTU is at the west part of Singapore, while Changi International Airport is at the east part of Singapore. Take MRT from airport. You may need to purchase an ezLink card. Transfer at Tanah Merah station. You need to take an MRT train towards Joo Koon. Get off at Boon Lay or Pioneer, then take a Bus 179 to NTU. Get off at Hall 2. Then look for NEC. 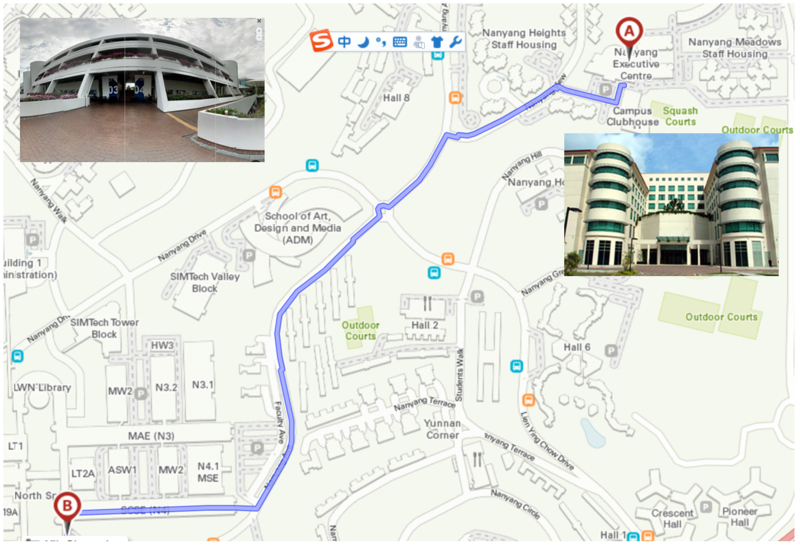 (1)Take Bus No 179 and get off after 8 stops at Canteen A & Lee Wee Nam Library. (2) Or take NTU shuttle bus Campus Rider(CR) get off after 4 stops at Administration Building. Please come in from Nanyang Avenue. Then get off at Carpark A. Please follow the route on the map to LT3.